With a stay at Grand Mercure Jakarta Harmoni in Central Jakarta, you'll be in the business district and convenient to National Archives Museum and National Monument. This 4-star hotel is within close proximity of Presidential Palace and Merdeka Palace. Make yourself at home in one of the 483 air-conditioned rooms featuring fireplaces and LED televisions. Complimentary wireless Internet access keeps you connected, and cable programming is available for your entertainment. Conveniences include phones, as well as safes and desks. Enjoy a range of recreational amenities, including an attached winery, a health club, and an outdoor pool. Additional amenities at this hotel include complimentary wireless Internet access, concierge services, and complimentary babysitting/childcare. Satisfy your appetite at the hotel's restaurant, which serves lunch and dinner. Dining is also available at a coffee shop/café, and 24-hour room service is provided. Relax with a refreshing drink from a poolside bar or one of the 2 bars/lounges. Buffet breakfasts are available daily from 6 AM to 10 AM for a fee. Featured amenities include a business center, complimentary newspapers in the lobby, and dry cleaning/laundry services. Planning an event in Central Jakarta? This hotel has 35736 square feet (3320 square meters) of space consisting of conference space and meeting rooms. Limited parking is available onsite. 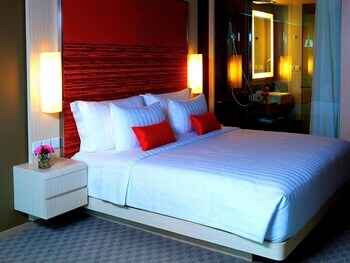 Grand Mercure Jakarta Harmoni is the best Jakarta lodging choice for your trip to Indonesia. With numerous amenities for guests such as 24 hour front desk, fitness center, gift shop, you will wake up at Grand Mercure Jakarta Harmoni feeling refreshed every day for your time in Jakarta. Don’t let this amazing reservation opportunity pass you by, book your stay at Grand Mercure Jakarta Harmoni today to make the most of your time in Jakarta, Indonesia.